Here you’ll find tips and information on outdoor palm tree care. Palm trees thrive outdoors in tropical and sub-tropical climates. They are a popular tree in coastal areas due to their ability to withstand the heavy winds generated by tropical storms. Proper outdoor palm tree care is easy when you take to time to select the best species for your comfort level and landscape environment. With the right knowledge, many palms are easy to grow and care for. You’ll be pleasantly surprised at how simple it is to ensure your palm trees grow and prosper. Small outdoor palms can be grown containers that can be set on wheeled platforms. The palm trees will be easy to rotate – ideal for exposing all sides of the plants to proper lighting. Wheeled platforms also make it easy to move smaller palm trees indoors for overwintering. Palm tree foliage comes in two basic forms: fan or feather. Fan palms have leaflets that radiate outward from the main stem in a circular pattern. Feather-like palm fronds have leaflets that emerge from a central vein in parallel lines. Mexican Fan palms (Washingtonia robusta) are known for being cold-hardy and feature the fan-like foliage. Lipstick Palm trees (Cyrtostachys renda) feature elegant, feathery palm fronds. The outdoor palm tree care tips featured below are general guidelines. Palm care requirements can vary by species. For specific requirements, refer to the particular palm tree species. 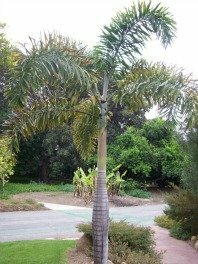 Typically, outdoor palms should be planted in a location that receives full sunlight; however, before planting a palm tree, be aware that it might need to be acclimated to full sun exposure. Avoid exposing a young palm tree to full sunlight if it was stored in a low-light environment. Your new palm might be getting too much sun if the leaves turn yellow, or dry out and begin to turn brown. Protect your palm by covering it during the part of the day when it gets the most sun. The palm tree can be acclimated by slowly reducing the amount of time it is covered. If your palm trees will be spending the winter indoors, they might need some time to adjust to lower light levels. Give them some time in a shady location outdoors before moving them indoors for the winter months. Keep in mind, palms that are grown in shade grow slower than those grown in the sun; however, the fronds tend to be a rich, dark green in color. Since palm trees grow in tropical and sub-tropical environments, they thrive in high temperatures (100° F / 38° C). Although some can withstand a slight chill, warmer temperatures are generally ideal. Fertilize palm trees during the growing season (approximately three to four applications). A single application of a high-quality, continual-release formula will feed your palm for a few months at a time. Do not fertilize newly planted palm trees until new growth appears – approximately six to eight weeks after planting. Palm Trees thrive in moist, well-drained soil. Established palm trees should be watered two to three times per week during warm months. During the winter, once a week should be enough. The best time to water palms is in the morning, or late in the evening, when temperatures are cooler. Always check the soil to make sure it is sufficiently moist. Adjust watering schedule if necessary. Newly planted palm trees should be watered every day for the first week, every other day in the second week, and two to three times per week thereafter. Signs of overwatering - leaves will turn yellow or brown. Signs of underwatering – leaf tips will turn brown. Check the moisture level of the soil. If palm trees are getting enough water, the soil will be moist down to the roots. Choose a location with well-draining soil; one that is not prone to accumulate standing water after rain or irrigation. Amend the soil to a consistency of equal parts loam, peat, and sand. Add some of the native surrounding soil into the mix. Aesthetic Concerns – Some palm species, such as the Washington robusta, have a “shag” or a “petticoat” of dry leaves. Sometimes these palms are groomed to attain a more manicured look. Safety – Too many dry, dead fronds can become a fire hazard. Palm Tree Health – Palms are pruned when transplanted to reduce moisture loss through transpiration because of the inevitable root loss. Palms are also pruned to cure or prevent disease. When purchased from a nursery, palms are either sold in pots or with their root balls rapped in burlap. Trees should be planted as soon as possible. If you have to delay planting, be sure to keep the palm’s roots evenly moist. Be careful when transporting and handling palm trees – damage to bark and root balls can leave palm trees vulnerable to pests and diseases. The best time for planting palms is during warm months (minimum soil temperature of 65° F / 18° C). Dig a hole twice the diameter of the root ball. Make sure the hole is deep enough so that the root ball will be sufficiently covered. After the tree is placed into the hole, backfill with the freshly dug soil. Add a soil treatment to the palm, such as Mycorrhizal fungi. This will help the roots of the palm to absorb much needed nutrients. Liquid forms of this treatment are available in containers that look like aspirin bottles and can be found at nurseries. After the palm tree has been planted, build a soil barrier around the hole to form a dam that will hold water. Add a layer of organic mulch around the base of the tree (approximately 3 inches deep). Frequent watering is essential after palms have been planted. Newly planted palm trees should be watered every day for the first week, every other day in the second week, and two to three times per week thereafter. Consider using a bubbler or arranging a hose around the base of the palm. It is important to keep soil moist, do not let it become dry. After palm is established, apply fertilizer during the growing season (approximately three to four applications). A single application of a high-quality, continual-release formula will feed your palm for a few months at a time. Avoid damage to palm tree bark when using lawn mowers and weed-whackers. Bark damage leaves trees susceptible to pests and diseases.